RARE VIDEO CLIPS…ELVIS, HOLLY, PERKINS, CASH, PLUS NEW PHIL OCHS TRAILER! As I was searching for some new video clips I made some extraordinary finds! The first is a one minute film taken backstage at a rock show in Texas in the ‘50s featuring ELVIS PRESLEY, BUDDY HOLLY, CARL PERKINS, AND JOHNNY CASH together for the first time…again! The second is a theatrical trailer of a man I knew slightly but respected greatly, Phil Ochs. His documentary, “There But For Fortune” is only playing at one theater in New York and it’s already #25 at the box office! Tags: ELVIS AND BUDDY HOLLY CLIP, ELVIS BUDDY HOLLY VIDEO CLIP, JOHNNY CASH CARL PERKINS VIDEO CLIP, PHIL OCHS, PHIL OCHS TRAILER "THERE BUT FOR FORTUNE"
THE TROUBADOUR FAMILY REUNION…AND THE BANNED PLAYED ON! 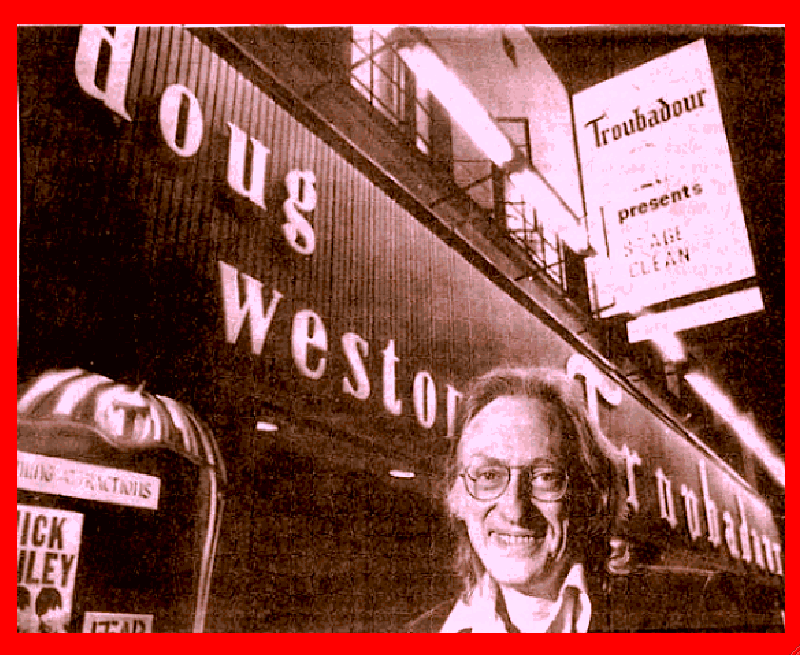 After reconnecting with a lot of my friends who are coming to the TROUBADOUR FAMILY REUNION Monday night January 17, 2011 I wanted to know a more about the club and the man who owned it, Doug Weston. In a time of civil unrest in America, Doug Weston wasn’t afraid to present controversial acts who were protesting the status quo. He gave the “political puppeteers” the finger when he booked Lenny Bruce, even though his license could have revoked.He also regularly presented anti-establishment performers that other clubs were reluctant to hire, including Richard Pryor, George Carlin, Lord Buckley, and Phil Ochs. The Hollywood Reporter said in his obituary, “Weston prided himself on the acts and audiences he attracted for more than four decades, from singer Linda Ronstadt to comedians such as the Smothers Brothers and Cheech & Chong. Elton John, beginning to make a name in England, played the Troubadour for six nights in August 1970, introduced by Neil Diamond. He came to consider the booking the best move of his career. 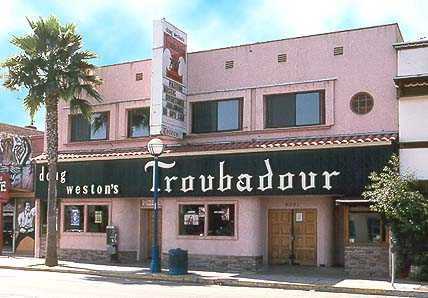 In the late 1960s and early 1970s, the Troubadour was considered the most consistently important showcase of contemporary folk and folk-rock talent in the country. Appearances there could guarantee major record sales for new and emerging artists. I asked Artist/ Photographer “Lezlie Sokol”, a former waitress at the club and one of the organizers of the REUNION, if she knew Doug. THEN I WENT ON THE INTERNET AND FOUND THIS INFO ABOUT THE LEGENDARY CLUB. Lenny Bruce is arrested on obscenity charges. After a gig by resident band The Men, Bob Dylan comes onstage for an impromptu “folk-twist” jam session – attended only by Troubadour staff. Shortly afterward, Dylan makes pop music history by switching from folk to folk-rock. The Byrds, who met at a Monday open mic, perform their classic take on Dylan’s “Tambourine Man” for the first time. Buffalo Springfield make their live debut. Joni Mitchell makes her Los Angeles debut. Comedian Richard Pryor records his live debut album. Poco, late from a Denver gig, arrive to find unknown comic Steve Martin doing their songs on banjo to a rapturous crowd. Neil Young plays his debut solo show in LA. James Taylor makes his solo debut. Tim Buckley records Live at the Troubadour 1969. Cheech and Chong are discovered by Lou Adler at a Monday Hoot Night. The Eagles’ Don Henley and Glenn Frey meet in the front bar. Elton John makes his U.S. debut, introduced by Neil Diamond. Neil Diamond releases Gold, an album recorded live at the Troubadour. Kris Kristofferson makes his Los Angeles debut opening for Linda Rondstadt. 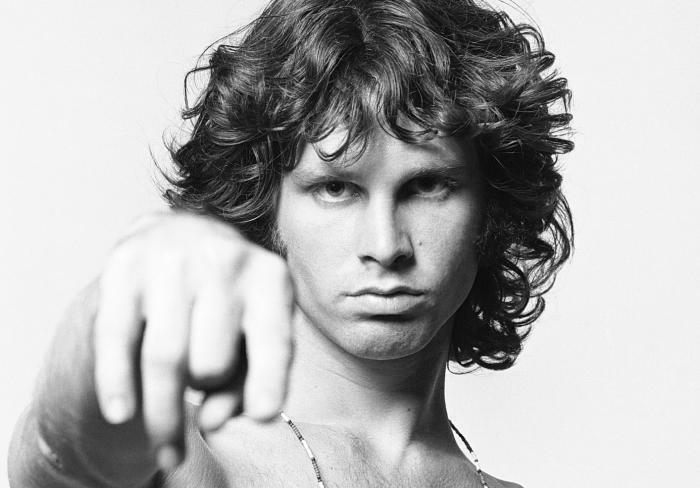 Janis Joplin parties at the Troubadour and the next day is found dead at the Landmark Hotel from a heroin overdose. James Taylor plays “You’ve got a Friend” for the first time. He heard his piano player (as well as opening act) , Carole King, play it during during soundcheck and they decided to give it a try. Lori Lieberman writes the song “Killing Me Softly with His Song” inspired by a performance by Don McLean at the Troubadour. Waylon Jennings performs in the cult classic film Cisco Pike. Tom Waits is discovered by rock manager Herb Cohen during an amateur night. Carly Simon, opens for Cat Stevens. Randy Newman returns to the Troubadour for a six night run to perform his masterpiece album “Sail Away”. The Bryds reunite and launch tour with a Troubadour show. Pointer Sisters make their debut performance. Bruce Springsteen & The E Street Band closed the hyped Columbia Records showcase week with a 90 minute set…that starts at 2 in the morning! John Lennon (wearing a Kotex on his head) and Harry Nilsson are escorted out of the club for heckling the Smothers Brothers. Elton John plays benefit show to raise money for UCLA’s Jules Stein Eye Institute. On the last night of a triumphant week of Average White Band shows, drummer Robbie McIntosh dies of a drug overdose. BRUNO MARS…BRUNO MARS…WHO ON EARTH IS BRUNO MARS? When you’re in the Baby Boomer generation (or older) we have a tendency to dismiss today’s music as being inferior to what we grew up with. You don’t have time to go through the bulls#@t to find the “Good Stuff”, so I’ll help find some “Good Stuff” for you! My current favorite artist is producer/ singer/ songwriter Bruno Mars, who not only is featured along with rappers B.o.B. and Travie McCoy who he produces, but is also having incredible success as a solo artist. His videos are superb and his potential is unlimited. WARNING…THIS VIDEO USES EXPLICIT LANGUAGE! THE TROUBADOUR FAMILY REUNION…DO YOU “QUALIFY” TO ATTEND? I was livid, as I reviewed my long history at the club which included hanging out with many stars who performed there and as well as vigorously supporting new singer/songwriters that “Hootmaster” Roger Perry presented on Monday nights. It was right outside the Troubadour when my friend Shel Silverstein convinced me that I could be as creative working for a publishing company as I could be as a songwriter. It was at the club that I hung out with some of the writers I represented before they released their first albums including Jackson Browne, Warren Zevon, and the Eagles, which is all detailed in my new book, “I DID IT FOR A SONG”. I even made a fool of myself a few times when I passed out into my coconut ice cream in the first row at Jimmy Webb’s opening and sang drunken harmony from the balcony with AMERICA and had to be quieted down. Another night I was sitting with Sonny and Cher, when David Geffen and Cher’s eyes met and they became tabloid headlines. I was an occasional music critic for Cashbox magazine, and from the balcony gave Don McLean, and “American Pie” one of the first national reviews. I was the guy who Atlantic Records’ Jerry Wexler thought enough of to take around from table to table and tell other reviewers what I thought of John Prine’s performance and stellar songwriting ability. When I mentioned all of this to that friend of mine who was one of the Monday night hoot regulars he said, “I still don’t remember seeing you there…you don’t “qualify”…it’s only for people were there on Monday nights!” Then I looked at the Reunion’s website and it said the same thing. Then I started to get angrier. 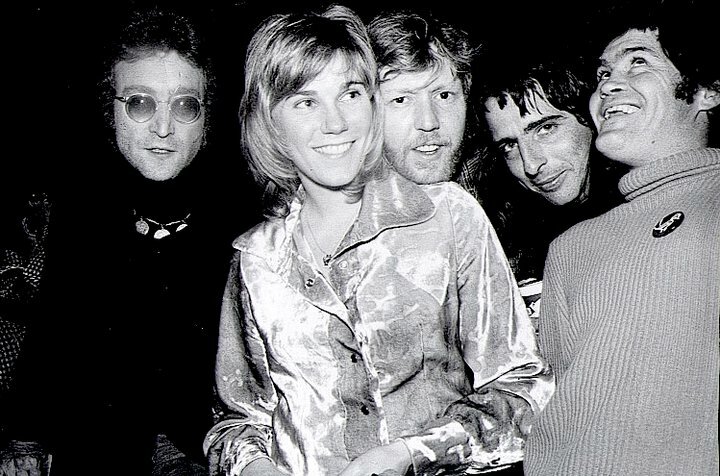 I wrote last week how I brought Olivia Newton-John into the Troubadour Bar on a Monday night to impress all of my friends as well as the industry “heavies” who held court at the bar. https://artiewayne.wordpress.com/2011/01/04/the-troubadour-family-reunion/ It was also on a Monday night when Glenn Frye and Randy Meisner of the Eagles wrestled me to the ground, took my highly polished Frye boots with “sissified” custom built platform heels, and threw them onto Santa Monica Boulevard as a joke. The “Troub”on Monday nights, was where I met and became friendly with journalists Peter Greenberg, Todd Everett, Chris Van Ness, Digby Diehl, Cameron Crowe, David Rensen and publicists Billy James, Corb Donahue, Bob Gibson, David Sweeny, Gary Stromberg, managers Abe Hoch, Herbie Cohen, Peter Rachtman, Jerry Heller, and Elliot Roberts. When I became the General Professional manager and director of Creative Services for three and a half years at Warner Brothers Music, I insisted that each of my four songpluggers maintain a presence at the club at least twice a week, sometimes bringing as many as 10 guests on “Hoot Night”. This effort wasn’t lost on the late owner Doug Weston, who bought me a drink from time to time, in appreciation for all the business I’d bring in. One of the things I’m proudest of in my professional life.life is helping to introduce “Karaoke” to America. In my last promotion for the Singing Machine Company, Doug Weston gave me a half hour on a Monday Night for me to sing over tracks and demonstrate this remarkable device. It was one of the first times, I’m told that recorded music was allowed to be used in a live performance at the venue. I started the show with songs everybody knew like “Sweet Caroline”, which they could sing along to, then I invited five of my friends (including journalists, Lita Eliscu, and Ellen Sander) up on stage to sing the chorus of a controversial song I just recorded called “WHITE WOMEN IN HEAT”. Although I got a standing ovation from the packed room, I was fired the next day by the Singing Machine Company for my “QUESTIONABLE” choice of material. 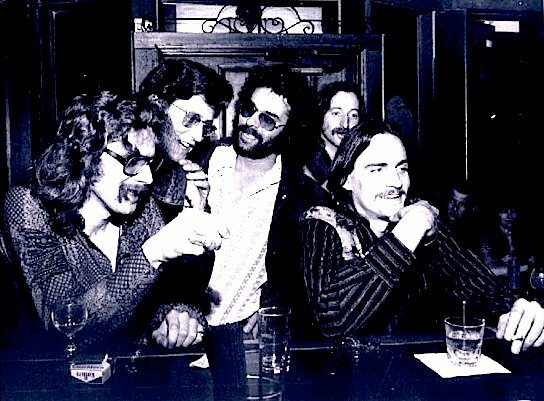 Picture in middle l to r Tom Rush, Michael Ochs, Allan Rinde, Elliot Roberts, and James Taylor at the Troubadour Bar.